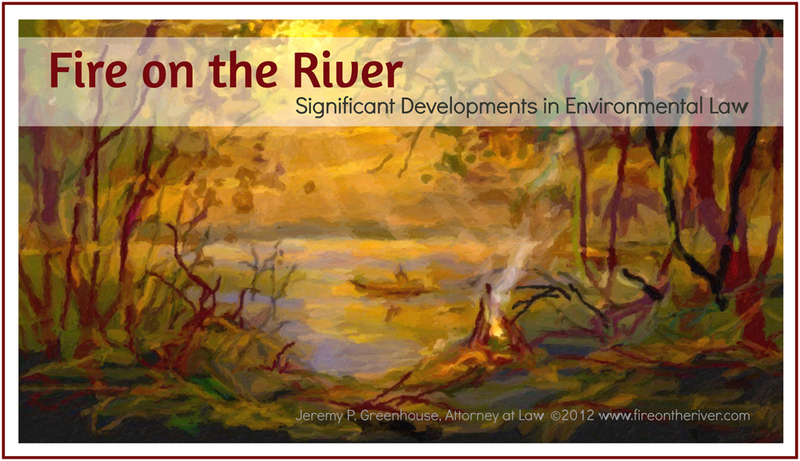 Supreme Court Stays Clean Power Plan | Fire on the River! On February 9, 2016, in a half-page order, the U.S. Supreme Court unexpectedly stayed the EPA’s “Clean Power Plan” (CPP) a set of performance standards aimed to reduce carbon emissions from existing power plants in the U.S. by 32 percent compared to 2005 levels. EPA, Carbon Pollution Emission Guidelines for Existing Stationary Sources: Electric Utility Generating Units, 80 Fed. Reg. 64,662 (October 23, 2015). (For more details on the CPP, see this earlier post.) The ruling is a significant blow to the Obama administration’s climate agenda, which significantly relies upon the CPP to further domestic and international pledges to reduce greenhouse gas emissions. The Court’s 5-to-4 order specifies that the stay will remain in effect pending not only a ruling by the U.S. Court of Appeals for the District of Columbia Circuit in the case, but also the disposition of any petitions to the high court to review that ruling. Justices Ginsburg, Breyer, Sotomayer and Kagan opposed granting the stay.